A guide to crafting unforgettable, attention-grabbing business communications - from speeches and letters to business plans - using stories from the world's top business leaders. 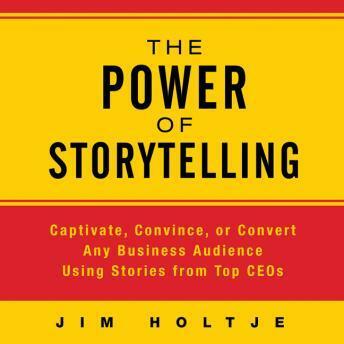 The world's foremost business leaders are also great storytellers. For example, industry titan Jack Welch has told how his mother instilled enough tough love and confidence in him to overcome the fact that he was the shortest kid in his class and had a severe stutter. Jeff Bezos, the founder of Amazon.com, often tells a story of setting up the company's first office in a converted garage. The Power of Storytelling collects the best of these stories, which listeners can use to strengthen their own communication. It's great for anyone who needs to lead, inspire, and motivate an audience in a business setting, whether they're writing speeches, pep talks, interview talking points, employee letters, or Op- Eds. With anecdotes from Bill Gates, Sam Walton, Ted Turner, Steve Jobs, and many more, this is an inspiring and immensely useful audiobook.